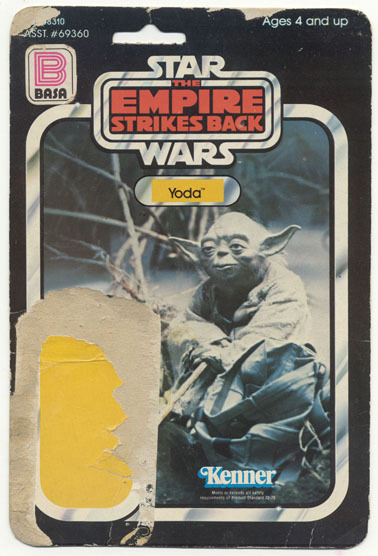 This piece is a regular US Empire Strikes Back 41-back Yoda backer card. What makes this piece special is the Basa logo in the upper left corner. Basa distributed Empire Strikes Back product for a short period of time in Peru. When Kenner Star Wars figures were first released in U.S they arrived in Peru basically via smuggling because during the final years of a military government (10 year rule), where the importation of foreign products had high taxes there was also a high inflation ratio (73% in 1978, 66% in 1979 and 61% in 1980). During these years the Kenner Star Wars toys cost around 4 to 5 times what they sold for in the U.S., thus these were considered luxury toys for the kids. In the early 1980’s, as new democratic government was ushered in, the importation of products was healthy and BASA began to import the Kenner ESB line. When they imported these U.S. toys they applied a BASA sticker on the front of the cardbacks and boxes. The toys appeared were available in large department stores as such Sears and Oechsle as well as supermarkets like Monterrey and Scala. Now at this time the BASA/Kenner toys were about 2 to 3 times their cost in the U.S. Most of the ESB carded figure line plus some ships and creatures as well as the ESB Micro Collection were available in Peru and BASA continued importing the toys throughout the Return of the Jedi line but they stopped applying the BASA decal on the figures. The ROTJ figures did not differ from their U.S. counterparts and the later Power of the Force line was never imported into Peru, thus those toys were never available in the local market. These pieces are extremely rare and locating a cardback like this is a true find. The only other evidence of these figures is the C-3PO backer card as well as a Bossk backer card seen at a Peruvian Star Wars convention. Currently no known BASA figures have surfaced in carded form.